If you think this writeup useful and would like to purchase a VPS to try it on, I would recommand Vultr. With this link, [http://www.vultr.com/?ref=6816672], you can do me a little favor to get me some credit from them without loosing nothing. 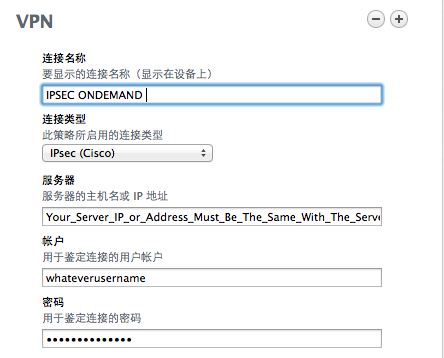 The only option can be choosen is IPSec, because the other 2 modes are not allowed to get on demand or always on feature. I don’t know why but Apple Configurator said that. I use Strongswan as an IPSec server and Apple Configurator to setup iOS, there are many guides out there but none of them takes care of the very important details which are critical to make it work just as what i imagined. A VPS Server out side of China, you can choose whatever places but i recommend Japan, Hong Kong, Taiwan and USA. Apple OS X to run Apple Configurator, iMac or Macbook or OS X in a virtual machine. 1. Install Linux on VPS server, I use Debian Wheezy, this guide also applies to Unbutu, CentOS, Redhat or whatever, it doesn’t important, but Debian makes it easier. 2. Install the latest Strongswan which is version 5.2.0 as of i’m writting. 6. Setup username, password and PSK secrets, Edit /etc/ipsec.secrets, change bold part to your favarite. 2.4 Save and export the profile but do not check “Sign the profile(给配置文件签名)”, because we need to manually edit this saved file to set up the very important part, if you signed it, after you edit with other tools, you can’t install this profile on iPhone. 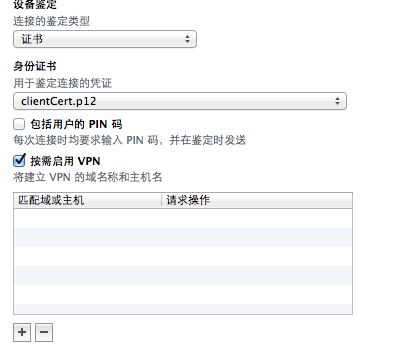 from Apple official document, Action — Connect means: Unconditionally initiate a VPN connection on the next network attempt. 2.6 So with the above settings, this is actually an Always on IPSec VPN for iOS, no matter what condition, as long as you have network, you can always get VPN on. Save the profile and install on iOS, you can email to your Mail.app or put the profile on a local http server and use MobileSafari to open and install.